Richard Wiseman is a former magician and now Psychology Professor at the University of Hertfordshire in the UK. Wiseman's renowned for his good natured debunking of paranormal phenomena and he writes an exceptionally entertaining blog. As a psychology professor, Wiseman writes a lot about how human brains perceive the world around them and his blog regularly features some really entertaining optical illusions. Check this out. Stare at the center of this image and count how many circles you see. Stare for a while and watch what happens. I see four down the right side immediately and then three more groups of four start to appear, starting on the left side and appearing column by column until I see 16 circles. 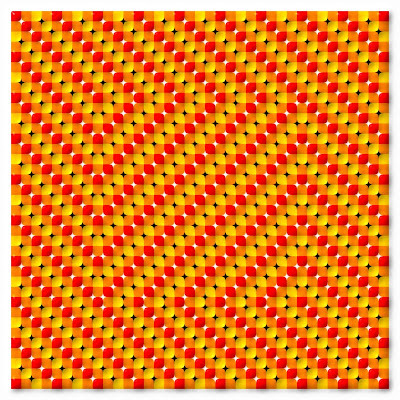 Once I can see the circles, I have to concentrate to break the image and see squares again. This second one's a little more inactive and easy to see. Human perception isn't infallible and these illusions illustrate that perfectly. Designers exploit this fallibility daily, at least this one does. Ideas like forced perspective and sight lines are grounded in the idea that human eyes (human brains actually) can be fooled pretty easily. It's some cool stuff. It would be really interesting if you were to do a post featuring the type of forced perpective and effects of sightline you mention in actual practice from selected photos and even from your own design work. Would that be isometric, dimetric or trimetric projection? Hah! That's a great idea for a post Susan. Sort of a design theory in practice series. Out of all of them though, forced perspective is my favorite and I use it all the time. Hmmm. This is a really great idea. Thanks! Cool!! I saw the circles in the first one right away. 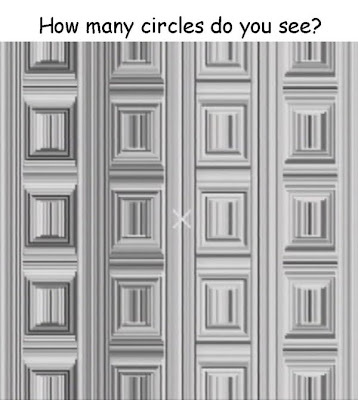 You're right, it's hard to stop seeing the circles after you see them!! I'll keep my eyes peeled for more of them. Check out Wiseman's blog, he runs them all the time. I love them and he finds the most interesting examples.